Growth5 is a venture capital marketing firm that helps companies maximize their growth potential. Venture capitalists commonly invest capital in hopes of a company's future growth. 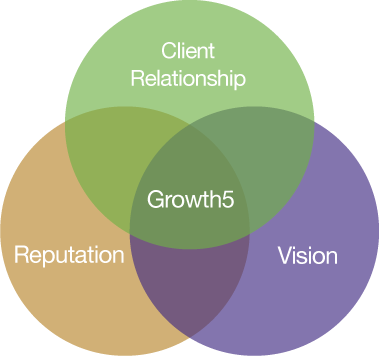 Growth5 invests marketing talent to help make that growth possible. The Growth5 approach, based on our philosophy and process, helps companies develop powerful messaging, deliver it to target customers effectively, and most importantly, fund the process. Ideal clients have outstanding potential that we leverage with our experience and capabilities. Enhance the three elements of your business that matter most to its growth.